~ White Pages ~ LOBO. (DC Comics, 1983) CGC Graded 9.8! This copy is CGC Graded 9.8! LoBo #1 (of 4). A nice flat, glossy, sharp copy. First Printing. Would be NM if not for ever-so faint back covers staining. NO INTERNATIONAL SALES. This comic features the first appearance of Lobo. I would consider this comic to be in fine condition. It is complete and intact. The page quality is white. What you see is what you get. This is from the 1991 series by DC Comics. Books are VF or better condition. 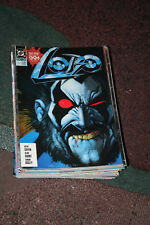 This is a newly graded copy of the LOBO #! Lobo #1( DC 1990 ) High Grade never opened. DC COMICS LIMITED SERIES. Featuring the talents of Keith Giffen, Alan Grant & Simon Bisley. In excellent condition, nice and clean. First prints. This item is a must have addition to your Lobo collection. CGC Universal Grade [Blue Label]. The Newton’s Rings can occur in varying degrees from barely noticeable to significantly visible. Lobo (1990 series) #3 CGC 9.8 NM/MT, White, Simon Bisley, the Main Man! Up for sale is Lobo #3 CGC 9.8 NM/MT with white pages! There are no cracks on the CGC case and there are no qualifying remarks on the CGC label. Lobo Complete Limited Series 1,2,3,4 I'm not a professional grader. The buyer should look at the picture provided to determine the grade of the comic. The pictured item is the item you will receive. All comics will come bagged and boarded and shipped securely. Shipping I combine shipping to give the buyer the best deals possible. Shipping cost for 1 comic will be $4.80 and .50 with be added for each additional comic and lots will be $7.85 and additional lots will be $2.00 unless noted otherwise. You get the best deal when you win multiply listings. I only ship to the US. Please always contact me with any issues there may be. I strive to have perfect feedback. I will give the buyer positive feedback as well. 1st solo Lobo story! In my estimation the book ranges in "NICE" (7.0) FINE/VERY FINE to (7.5) VERY FINE- condition. Very moderate wear to cover, spine, corners & edges. Couple faint creases at spine edge. LOBO #1 from his first miniseries in 1990. In my opinion this comic book is in VF-NM condition. Lobo Infanticide 1. Lobo #1, 2 (3 copies), 3, 4 (2 copies). Lobo Paramilitary Christmas Special. Looks like food?. Lot includes 9 books & 1 display. It is CGC graded 9.6(NM ). First appearance of Lobo. "Assault on Euphorix.". Harry Hokum interrogates Kalista. Chapter two of the Citadel War. Script by Roger Slifer, pencils by Keith Giffen, inks by Mike DeCarlo. Cover by Giffen and DeCarlo. Lobo Lot! Run! Collection! #1s! Mini Series! Awesome reading! 20+ books! These comics are not graded, we are not comic book dealers of collectors. Sold as is. ALWAYS A TREASURE FROM STORAGE PIRATES! Now for the stuff no one reads, lol. But no one's perfect. Really nice action page with Lobo front and center - this is one of his early appearances, before the release of his mini-series. Box holds 24 CGC comics. This box will protect your CGC books in your collection. Box holds CGC books upright such that labels ( on end) can be seen. This is not the. ~ CGC Graded 9.6 ~. Official CGC. Complete Run - Simon Bisley - Keith Giffen - Alan Grant. Lobo #'s 1, 2, 3 & 4. VF /NM Condition. This lot contains four comics: Lobo #1-4 Condition is very nice. Please refer to pictures. No hidden defects. Comics ship bagged and boarded in a flat mailer box via USPS Media Mail. Thanks for looking! See more CGC and raw Comics Here. Lobo: Slipcase Collection TPB RARE 3 volume set w/Postcards FACTORY SEALED NEW. Shipped with USPS Media Mail. ~ George Freeman Cover ~. Box holds 24 CGC comics. This box will protect your CGC books in your collection. Box holds CGC books upright such that labels ( on end) can be seen. This is not the. ~ CGC Graded 9.8 ~. Lobo 1990 #1-4 (Lobo's 1st series). Lobo's Back #1-4 (Lobo dies, goes above and below, gets resurrected). L.E.G.I.O.N.89/90 #1-16 (Lobo's first superteam). Lobo 1993 #1 (embossed cod piece). Lobo:Paramilitary Christmas Special #1 (super violent attack on Santa). This is a First Printing. DC Comics 1991. Reprints Lobo #1-4 Features the work of Keith Giffen, Alan Grant and Simon Bisley - lots of violence, action, murder & mayhem - Lobo style. This item is a must have addition to your collection. OMEGA MEN 1 DC COMICS COPPER AGE 1st APPEARANCE COMBINE SHIPPING LOOK! Up for auction is a copy of Omega Men #1 in NM condition. Assigned grade is my opinion based on Overstreet grading standards, and I am not a professional grader so please see pics. I do combine shipping! Combined shipping is as follows: 1-3 books $6.00 USPS FIRST CLASS 4-7 books $8.50 USPS FLAT RATE ENVELOPE 8 books $15.50 USPS MEDIUM FLAT RATE If you would like more pics, or have any other questions, please feel free to email me. Lobo's Back. Lobo Infanticide #1 - no visible defects. The Lobo Paramilitary Christmas Special #1 - slight wear top/bottom of spine. Lobo Blazing Chain of Love - very slight wear bottom left corner. A VG copy may have an accumulation of minor defects or one or two major ones. Average Grade VF- 7.5 Except #3. #3 Has A Small Piece of Tape on Bottom of Spine. No Flimsy Envelopes. His job is intergalactic bounty hunter. You see, Lobo is the last survivor of his race.an entire civilization that he personally annihilated just because he wanted to be unique in the universe. But Lobo seems to have missed one, and now that survivor's gone and written an unauthorized biography of Lobo, which doesn't make our maniac very happy. (1-4) 1990 GRANT BISLEY. Full set of the 4-issue Lobo limited series. NEAR MINT/MINT CONDITION. HIGH GRADE. COMPLETE SET. Lobo #4 (1990-1991) DC Comics - 5 Comics Comics may be direct edition or retail edition (UPC Code). For sale is one DC Lobo number one from 1990. This book comes CGC signature series verified with a grade of 9.6 with white pages and signed by Simon Bisley and Keith Giffen. Please see attached photos and also check out my other collectibles at great prices. RAGMAN #1 - #8 complete limited series. by Keith Giffen / Pat Broderick. 9.0 VERY FINE/NEAR MINT (VF/NM): Nearly perfect with outstanding eye appeal. A limited number of bindery/printing defects are allowed. Great addition to your collection; enjoy! THE LOBO PARAMILITARY CHRISTMAS SPECIAL #1. Violent Christmas tale about the Easter Bunny hiring Lobo to kill Santa Claus. Publisher: DC Comics. Grade: 9.4 NM. We appreciate your patience in these instances. Legendary Comics, The Tower Chronicles preview from 2012. THE COMIC WAS HAND SIGNED BY SIMON BISLEY & MATT WAGNER. The comic was hand signed by Bisley at the East Coast Comic-Con, 2015, and by Matt Wagner at the annual Baltimore Comic-Con 2014. Also what you see in the picture is what you will receive. This includes CGC Qualified books. Most will also have a photo of the creator doing the signings at that exact event (The picture may or may not show the exact book. ).